Strong prolific vine, ensuring excellent fruit cover. 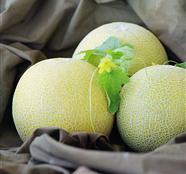 The round, 1.2 - 1.8 Kg fruits, have a creamy white flesh, and a pale green rind with medium-light netting. With a high sugar level of 13 - 15 brix, this variety has a sweet outstanding flavor. Mimas F1 is a very early variety with high homogeneous yield.